Our Products >> .470 Capstick, Kynoch, Limit 1 Cartridge, not a box! Please Note: Limit One Cartridge per Collector. One Cartridge. 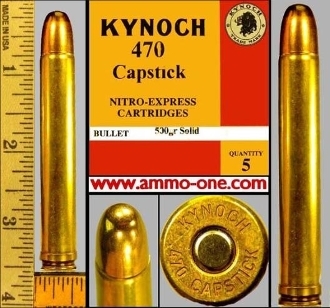 Not a Box: .470 Capstick by Kynoch of England, factory produced using new Kynoch brass cases with “KYNOCH 470 CAPSTICK” Head-Stamp and loaded with a 500 grain CPSFMJ (Copper Plated Steel Full Metal Jacket) projectile. The cartridge was designed in the USA , even thought this specimen was produced by Kynoch in England. The 470 Capstick is a Huge Proprietary Cartridge that was designed by Col. Ardor B. Alphin. It was named for the famous big game hunter, and author Peter Capstick. I have not been able to find out the year it was introduced. It started as a wildcat cartridge, by necking out the 375 H&H Magnum Case to except .475" diameter, 500 grain projectiles. It is now made by a very few small ammunition companies, which now makes it a Proprietary Cartridge. .470 Capstick, Kynoch, Limit 1 Cartridge, not a box!